I was missing the point, my friends chided, to be popping my Minetta Tavern cherry at brunch and not dinner. Well, I didn’t feel like popping my Minetta Tavern cherry in a madhouse, or at 5 p.m. or at 11:30 p.m., when we normal people are allowed in. Brunch seemed like a perfectly tame time to do it. And besides, all I really wanted on my first visit was the Black Label Burger anyway. The Black Label Burger was very good. Was it $26 worth of good? If you consider $26 an adequate price to pay for one of the best burgers you might ever eat, yes. If not, no. 2. Such a velvety texture I have not met in a burger in such a very long time. I don’t know how a burger can manage to be fluffy, but it was. The inside was rosy and juicy, cooked medium-rare as ordered. 3. The bun: it’s fluffy too, without being flimsy or spongy. The crumb is just sturdy enough to withstand the moisture from the meat, but not so sturdy as to interfere with its texture. My friend Houston ordered the regular Minetta Burger ($16), so we were able to do a side comparison between the two burgers. 1. 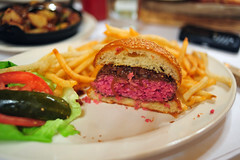 The beef in the Minetta Burger is not dry-aged. 2. The Minetta Burger comes with cheddar cheese. 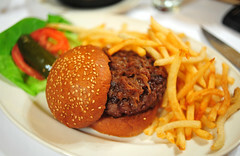 Otherwise, like the Black Label Burger, the Minetta Burger has the same wonderful texture and soft bun. So really, the question should be: is the dry-aged beef worth $10 more than the beef in the Minetta Burger, since they are essentially the same otherwise? I say it is. After tasting the Black Label Burger, the Minetta Burger (even with the cheese) tasted like a sip of water after a glass of wine – flat and a tinge sour. Of course, the flip side is, after tasting the Minetta Burger first, one (not me) might be inclined to find the flavor of the Black Label Burger to be a punch in the face. I know a few people who prefer the Minetta Burger. But I don’t know anyone who wouldn’t prefer either burger to any other burger on the market. The burgers at Minetta Tavern really are great. At noon on a Sunday, Minetta Tavern wasn’t a madhouse. But it wasn’t empty either. Actually, it was quite full. And when Minetta Tavern is quite full, it feels really full. The tables are tiny and the spaces between them are even tinier. The banquette tables at Minetta Tavern make the ones a la Grenouille (plug for a review to come) look like a Wal-Mart parking lot. 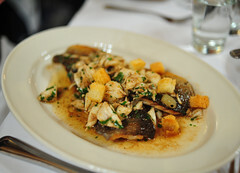 My friend The Wine Whisperer ordered the Filet of Trout Meunière ($27), a reminder of just how wonderful a properly toasted buerre noisette can be, and how uncommon large lump crab meat is. Only a dash of fresh lemon juice would have made this dish better, more exciting. It tasted pretty monochrome. 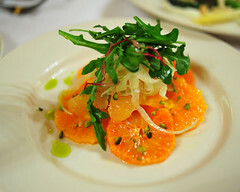 We three also shared a plate of “Asparagus Vinaigrette” (more “asparagus ricotta” than “asparagus vinaigrette,” $16) and a salad of especially juicy and sweet tangerines with shaved fennel and pistachios (“Salade d’Agrumes,” $14). Both were good, if not a bit pricey. 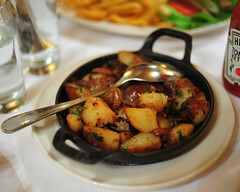 There was also a skillet of hearty “Duck Hash,” served as a side ($9). Though flavorful and well-made (strips of duck confit and melted onions tucked here and there), there wasn’t enough crisp on the potatoes for me. The wedge of “Coconut Cake” ($9) was delicious, with a moist, loose crumb and rich pastry cream filling. 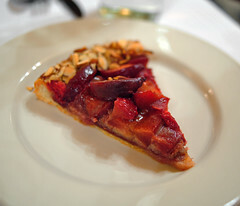 The “Balthazar Seasonal Fruit Galette” was striking for its mantle of apricots stained garnet by rhubarb, and the crust was blessedly crisp, flocked with toasted almond slivers ($9). Both were great. Service was friendly, if not a bit uncoordinated. Our burgers arrived prematurely, sending servers scrambling for our unfinished plates to make way. We scarfed. They grabbed. 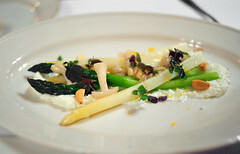 One Michelin star? Surprising. But I’ll have to meet disappointment before I’m shocked. You know what Minetta Tavern is? It’s a French bistro masquerading as an American period piece. I’ll admit, Keith McNally cast a good one. It has the same sense of permanency that Balthazar has. There are mural maps from the 18th century, scratched and chipped to make them look original. There are old-time cartoons, and black and white stills of ghosts of the restaurant’s past. The Rat Pack might show up anytime now, you might believe. I’ll be back for their “Côte de Boeuf,” their “Black Pudding Clafoutis,” and whatever else might be more appealing on their list of daily specials. * This burger needs condiments like a pig needs fat. Trust me, it’s got plenty of personality on its own. Ruin it with ketchup or mustard or mayonnaise if you like, I’ll enjoy mine as it’s served. ~ by ulterior epicure on May 13, 2010. Just re-read this post as I plot for my NYC visit – thank you! but black pudding clafoutis sounds wonderfully evil – wonder if we can fit that in during our trip …. @YKL: Glad you found this post useful. Have a great time! I can’t wait to read all about it.